A couple years back, I took a classic family recipe from AllRecipes.com and brightened it up with lemon and fresh herbs. Since eating tzatziki out of the bowl with a spoon is probably frowned upon, I make Greek inspired turkey burgers to go with it. 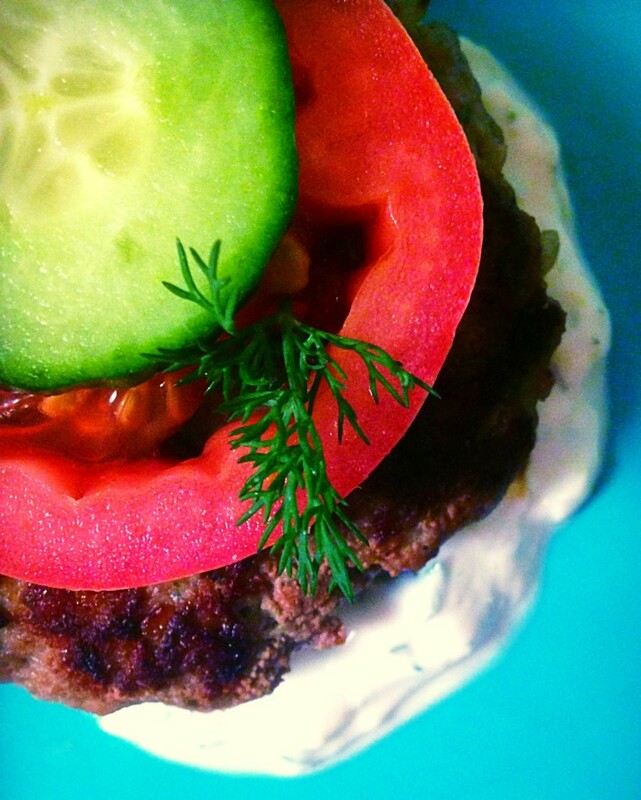 The burgers are almost as amazing as the sauce, but it’s definitely all about the tzatziki! an overwhelmingly sharp chunk of garlic. To do this, I lay the garlic clove on my cutting board and crush it using the side of my knife. This technique allows the oils to release and helps the clove separate from its ‘skin’. Next, I mince the garlic as finely as possible before sprinkling a pinch of salt on top. Finally, I use the side of my knife to press down on the minced garlic/salt mixture until the garlic turns to a paste. The paste will make a world of difference by evenly distributing the garlic flavor throughout your dish. Grate the onion. 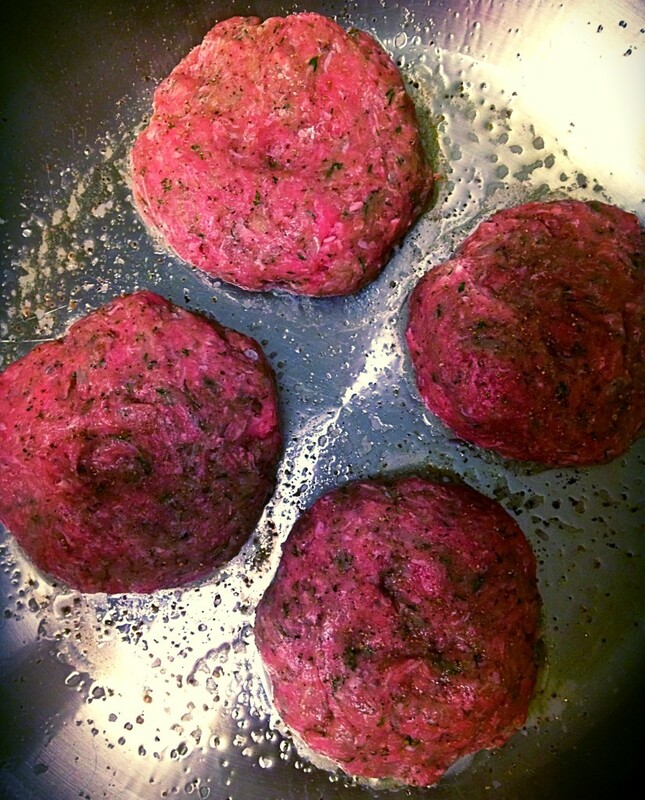 Onion adds great flavor to these burgers but it should be completely incorporated throughout the meat. Much like raw garlic, raw onion can be an intense flavor. That’s why I grate the onion using a cheese grater to turn it to a paste-like texture. This helps evenly distribute the flavor without the risk of biting into an overpowering chunk of onion… although if you’re like me, the onion may make you cry! Let the cucumber sit. Cucumbers contain a ton of moisture, which makes for a watery tzatziki sauce. 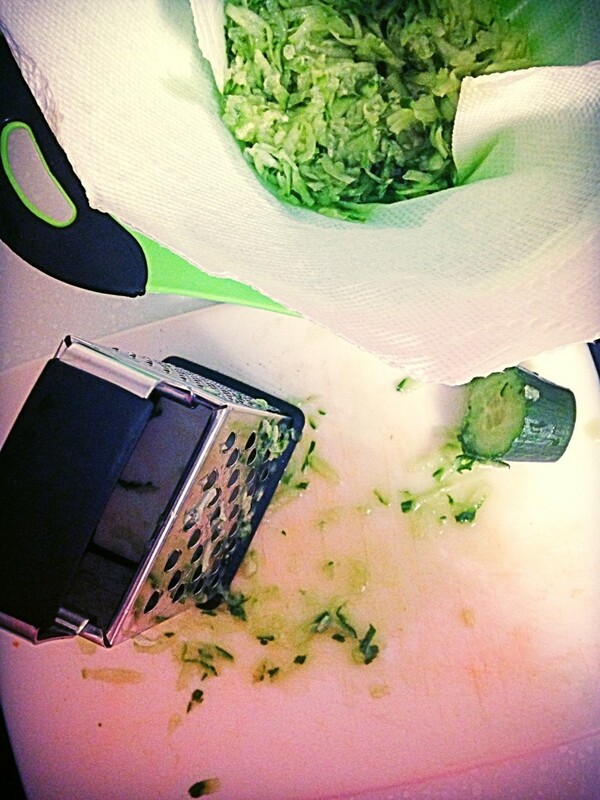 After grating the cucumber for this recipe, I place it in a colander lined with paper towel. Letting the cucumber sit for at least 10 minutes then squeezing out the excess moisture will create a thicker sauce that will last longer and have a better consistency for days to come. Bobby Flay tip: Burgers have a tendency to plump while you grill them, but this can be avoided. One tip from Bobby Flay among others, is to make a well in the middle of the burger using your thumb before grilling. This will give you a flat burger each time. Line a small colander with paper towel and set aside. Using a cheese grater, grate the cucumber and place into the prepared colander. Let sit for 10-15 minutes while you prepare the rest of the sauce. 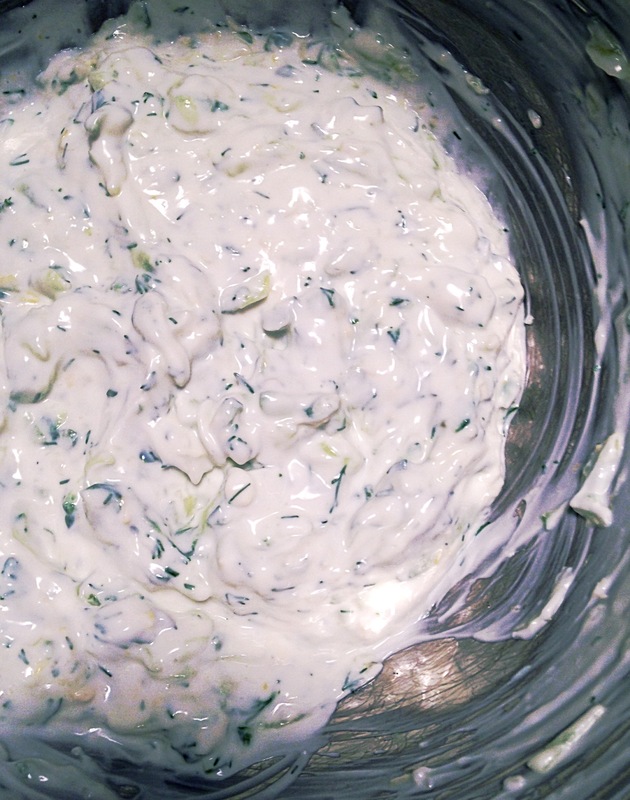 In a medium bowl, combine the Greek yogurt, sour cream, lemon zest, lemon juice, dill, garlic paste, salt and pepper. Set aside. Wrap the cucumber in the paper towel and squeeze as much moisture as you can from the cucumber. Add the dried cucumber to the tzatziki mixture and combine. Serve as a topping to your burger or as a dip to fresh cut vegetables. 1 lb. ground chicken, turkey, beef, or lamb. 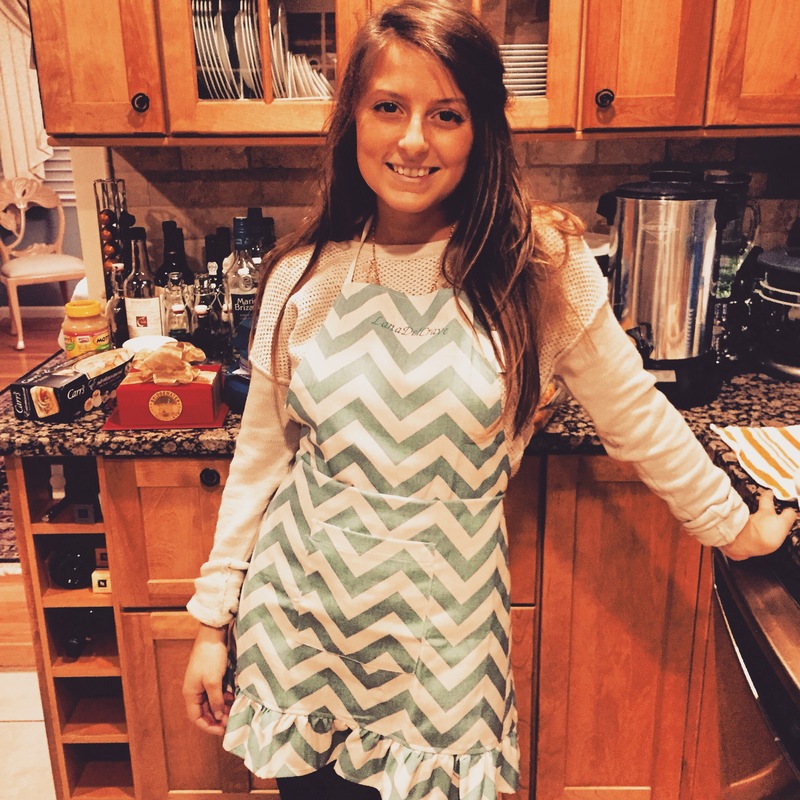 I use chicken or turkey to keep this dish light but tzatziki goes with everything! Heat your grill, grill pan, or pan atop the stove. In a large bowl add the meat, onion, garlic paste, dill, oregano, salt & pepper. Using your fingers, mix until just combined. Form the burgers - including creating the well in the middle of the patty to keep them from plumping while cooking (last 'tip', above). Spray your grill, grill pan, or pan with non-stick spray of your choice and cook to your desired temperature. Note: Chicken and turkey should be 100% cooked until completely white in the center. As I typically use chicken or turkey, I grill the patties until they're cooked about halfway up the first side before flipping to cook the second side. To make for a moist burger, I flip the patties only once and never press down on them! Serve with or without a bun, a heaping pile of tzatziki sauce, fresh sliced tomato and/or cucumber.